July 25 is National Hot Fudge Sundae Day. This food holiday celebrates a delicious ice cream dessert topped with hot sweet sauce. 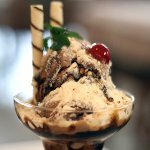 A sundae typically consists of several scoops of ice cream topped with syrup or sweet sauce. Sometimes other toppings are added including whipped cream, sprinkles, fresh or canned fruits, maraschino cherries. Heated-sauce sundaes are a variation of sundae in which the syrup or sauce is heated before being poured over ice cream. Hot fudge sundae is the basic type of heated-sauce sundae. It is made with ice cream (any flavor can be used though vanilla is the most common), hot chocolate sauce, whipped cream, sprinkles, and nuts. It is typically topped with a single maraschino cherry. The hot fudge sundae has several variations. For instance, the double fudge sundae is twice as big and is made with extra fudge and whipped cream. The caramel sundae includes heated caramel sauce instead of heated chocolate sauce, and in the butterscotch sundae heated chocolate sauce is replaced with butterscotch. The turtle sundae is made with vanilla ice cream, hot caramel and hot fudge sauces, and toasted pecan nuts. To celebrate National Hot Fudge Sundae Day, indulge yourself with any type of hot fudge sundae.